Raphael is responsible for leading Vodafone’s Corporate Social Responsibility supply chain initiative and the company’s responsible marketing programme. Raphael is on a two-year secondment from Vodafone New Zealand where he was Community Relations Manager for two and a half years. 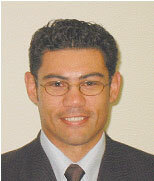 Prior to joining Vodafone, he was a press secretary in the New Zealand Prime Minister’s office. Raphael has a law degree and arts degree from Victoria University of Wellington and is a qualified journalist. It would be hard to imagine two more unlikely bedfellows than the ICT sector and coltan mining in the war torn Democratic Republic of Congo. But this is one result of the many complex global supply chains that criss-cross the world of electronic items such as mobile phones and laptop computers. A key lesson from the coltan issue is that high-tech industries are not immune from the social and environmental problems of the developing world. In fact, the ICT sector now bears significant responsibility for these problems because of complex global supply chains that extend into almost every country. From Coltan comes tantalum – a metallic element used in the electronics, aviation and medical industries. It is twice as dense as steel, highly resistant to heat and capable of storing and releasing an electrical charge, making it ideal for miniature capacitors. It is found in several countries including Australia, Thailand, Nigeria, Canada, Brazil, Malaysia, and the Democratic Republic of Congo (DRC).In the DRC, people are able to make good money by surface mining coltan, the local tantalum ore, using shovels and sieves. When demand for tantalum peaked in 2000, DRC miners were able to earn a staggering $80 a day.Unfortunately, most of the miners found their coltan deposits in National Parks, located in rebel-held areas, where warring factions have been responsible for humanitarian atrocities, deforestation, illegal hunting and the wholesale killing of endangered species to feed coltan miners.In the past five years, poachers have killed all but two of the 350 elephants that once roamed the Kahuzi Biega National Park. The story is the same for gorillas in the eastern Congo, whose population of 17,000 in 1999, is now estimated at no more than 1000.In response to the DRC problems, some ICT companies have declared a boycott on the use of Congolese coltan. However, due to smuggling and the nature of the world market, it is almost impossible to guarantee that coltan purchased on the ‘spot’ market is not from the DRC. Furthermore, a blanket boycott may have adverse effects on the DRC, which desperately needs economic investment and support to alleviate poverty.The Global e-Sustainability Initiative (GeSI) is continuing to monitor the tantalum / coltan issue and supports the view that a long-term, sustainable solution is required. This may involve the establishment of a regulated Congolese coltan market, comprising a buyers’ collective that would pay a fair price for ethically mined coltan. Whilst not the easiest solution, this could contribute significantly to the peace process by providing much needed economic support to the DRC.GeSI is also aware that a long-term solution to the DRC tantalum issue will require the support of interested parties such the United Nations, the World Bank and relevant Non-Governmental Organisations like Fauna and Flora International. What is now required are effective policies and processes to help the ICT sector to manage its responsibilities and to protect and promote basic human rights, labour rights and environmental stewardship in the supply chain. With these goals in mind, GeSI has established a Supply Chain Management Working Group to explore ways in which ICT sector companies can work more closely to effectively manage social and environmental risks in their supply chains. A key focus of the working group will be the alignment of various Codes and Policies already used by various ICT companies to manage supply chain issues. “We are aware of a wide range of Codes of Conduct and other documents used by ICT companies to manage their social and environmental risks and there is probably a great deal of overlap and duplication,” says GeSI Chairman Chris Tuppen. Dr Tuppen says it will not be easy to get agreement on all issues affecting supply chain management, but most companies should be able to agree on basic human rights, labour rights and environmental issues. “It’s really a case of creating the right forum for people to share their views and their approach to managing these issues and defining the common ground so that we can establish robust standards for the sector,” Dr Tuppen says. GeSI is an initiative of ICT service providers and suppliers, supported by the United Nations Environment Programme (UNEP) and International Telecommunication Union (ITU).GeSI was launched on 5 June 2001 during the World Environment Day in Turin, Italy and its members are playing a leading role through a commitment to manage their own business operations in an environmentally friendly way and to promote sustainable business practises around the world. The current members of GeSI are:AT&T, British Telecommunications, Bell Canada, Deutsche Telekom, Ericsson, ETNO (The European Telecommunication Network Operators Association), mmO2, Telcordia Technologies, Telefonica, Telstra Corporation, Vodafone.